Asia Trip 2016 – Wk 4 – PINKKLOVER. This week has been rather busy with celebrations for the Chinese New Year. We began with a wonderful home cooked feast surrounded by lovely family and friends. 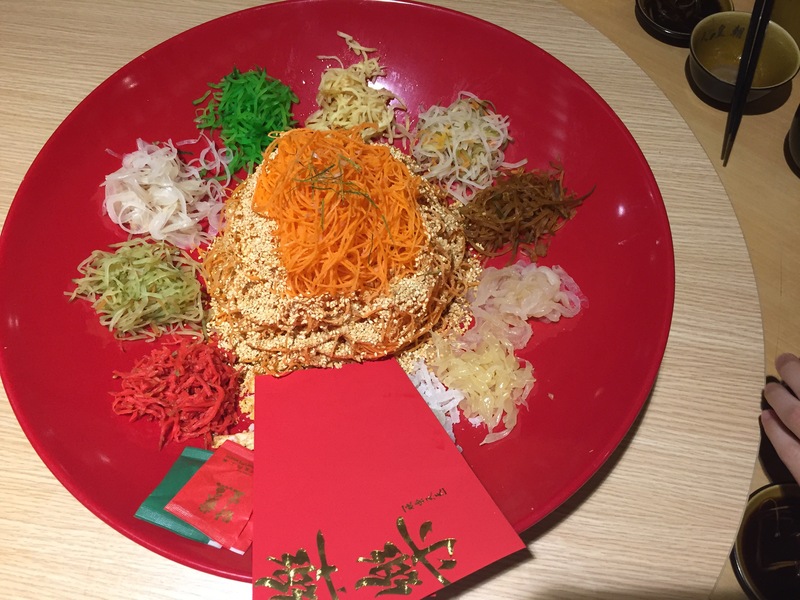 Also, throughout the week, there has been many Loh Hei’s which is a tradition of tossing the prosperity salad with family members and friends. And as we toss the food high up in the air (it can get quite messy and loud XD) each and every one of us will say auspicious sayings. It was quite fun and I lost my chopsticks quite a few times during the Loh Hei. It’s CHINESE NEW YEAR! It’s my first time celebrating CNY in Singapore and it was a similar experience to what I’m normally used to in Australia. In terms of celebration, we mainly spend it with family and friends which is no different to what my family does in Australia. Also, I don’t see many people adhering to traditions of wearing new clothes to celebrate the New Year. I think China is more loud and boisterous in terms of New Year Celebrations so I would definitely go back to China to celebrate CNY one day! After that, we travelled all the way to Causeway Point for dinner with our family members. We went to this Chinese restuarant to have our CNY dinner and even had Loh Hei (traditional dish served during CNY). After a wonderful CNY celebration yesterday, we also had another CNY party today with family and friends. Those who are unmarried or the elderly received red packets and we also had another round of Loh Hei! The only thing that was different to any CNY celebration I had so far was GAMBLING! Not the usual poker but card games. We mainly played Blackjack & In Between. Although the stakes weren’t high, the money actually grew to a few hundreds and I accidentally made my auntie lose $100+ when I dealt her cards XD SORRY AUNTIE! And also made my grandma lose quite a bit when I also dealt her cards too hahas! I guess in summary, don’t let me deal the cards! But it was all fun! Great night and very memorable! This morning I had an unforgettable breakfast! PRATA! Prata is life, yum and deliciously wonderful! Thanks Madz for bringing me here!!! I’ve been telling her that I’ve been craving for prata and murabak since my last visit to Singapore a few years ago. It’s unfortunate that Sydney doesn’t really have this freshly made but in frozen packets so you can tell that I was quite excited for this. This place we went to is in Jurong East and is quite busy. I can see why though, the food was amazing! 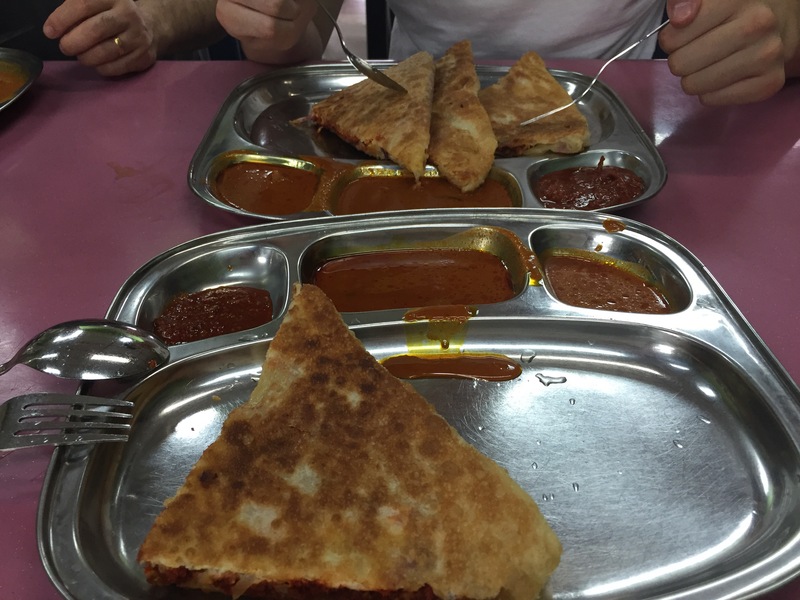 So I ordered a mutton murtabak whilst the others ordered different forms of prata. YUUUUUUUUUM. 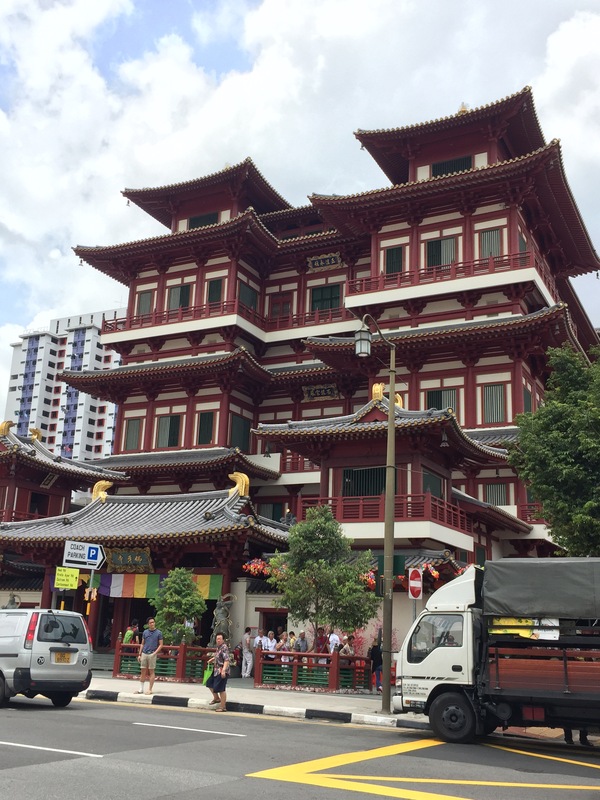 Then for lunch, we headed off to Bugis for some food and shopping! Since I already shopped quite a bit in BKK, I didn’t think I needed to buy much in Bugis except some face products =) I realised that most of the clothes I saw in Bugis were pretty much the same in BKK except pricier and poorer quality. So I’m definitely glad I did all my shopping at BKK! Then we went to meet a close friend and went to this place which has been remodelled from a warehouse to a modern cafe for some food and drinks. 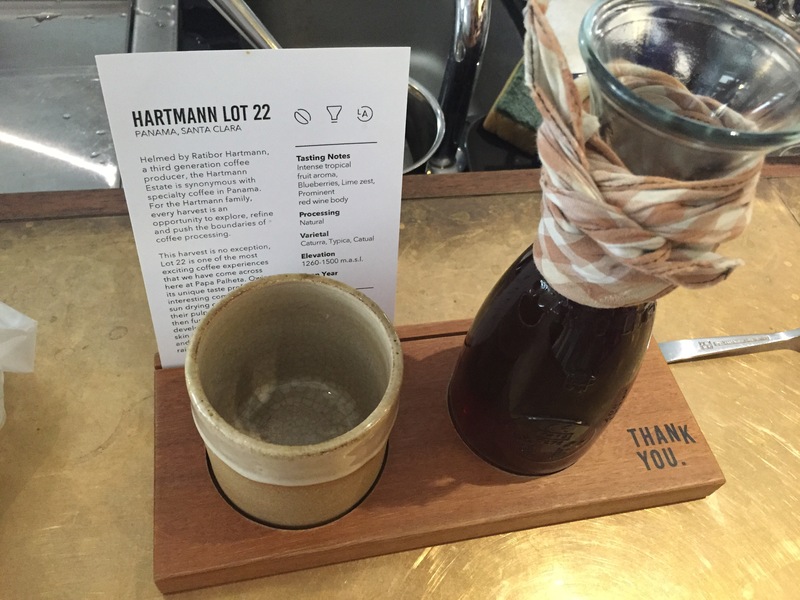 It was alright, definitely popular with the locals but not my fancy – Sydney has better coffee. But the one thing that annoyed me is that I was expecting all the flavours it said it would have (look at pic below under ‘tasting notes’) but it just tasted like a normal long black. WTH!?! After that, we had dinner at this Japanese restaurant at Tanjong Pagar and what was amazing was the fact that their bathroom was stocked with so many things i.e. 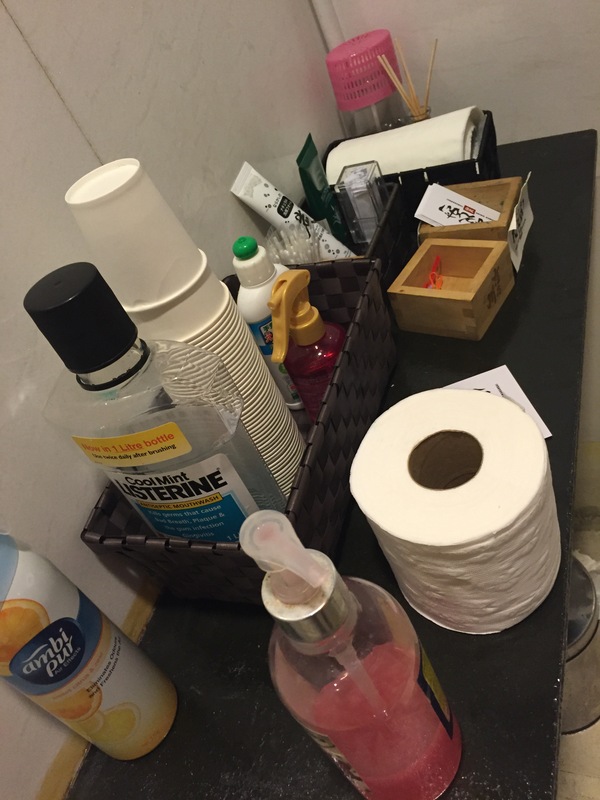 Listerine, hand cream, toilet freshener, hair gel, face mask, etc. Isn’t that fantastic?!?!?! After a delicious meal, we went to this rooftop bar called ‘LeVeL33’ which allowed us to have this amazing view of Singapore’s beautiful sights including the Marina Bay Sands and Gardens by the Bay. Plus, their craft beers are very smooth and nice. A very enjoyable night! 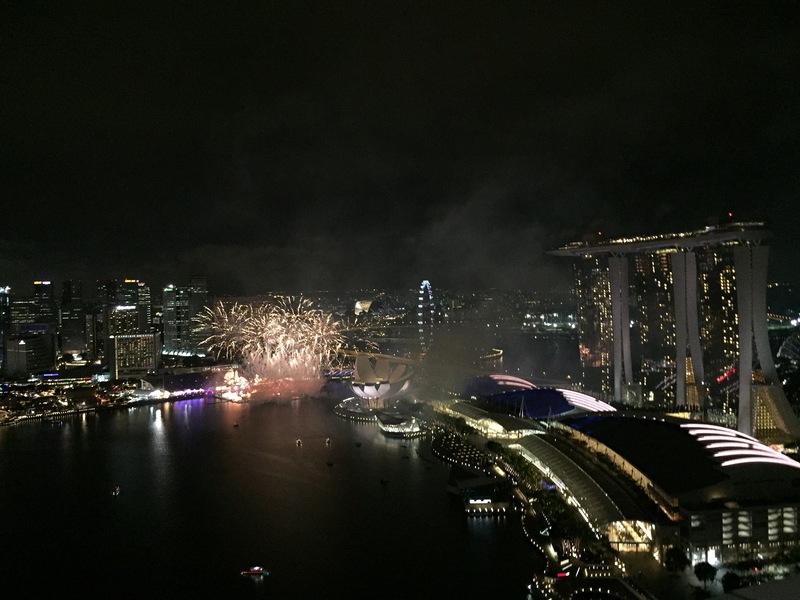 view from LeVeL 33 Rooftop bar – so glad we had fireworks!! For breakfast, we ate nasi lemak! YUM! But the spice was a kicker! SO SPICY but yummy! After that, we got ready to visit some of our distant relatives for CNY greetings. 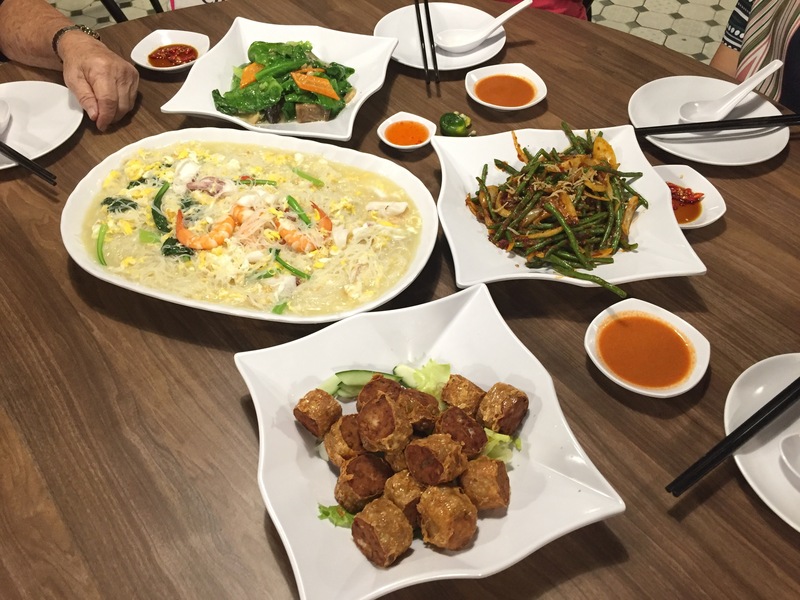 We had lunch at this wonderful restaurant at Sembawang called “White Restuarant” as they are known for their white bee hoon noodles. It was really delicious and had a unique taste different to other bee hoon dishes I had in Singapore. I would love to come back here again when I have the chance. Friday…such a busy day! We actually bought a one day explorer pass from Singapore Airlines and decided to use it today. 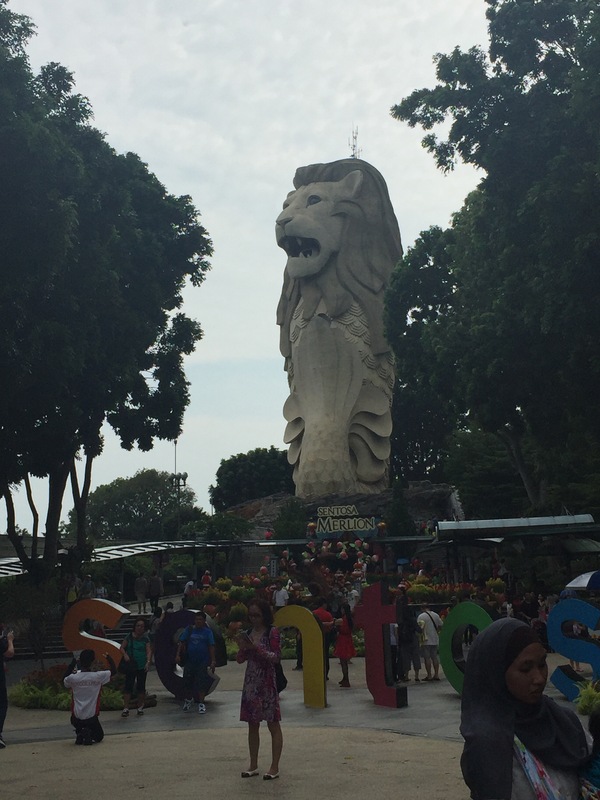 So we took a cable car to Sentosa as our main priority is to go to Universal Studios! Little did we know that coming here would’ve wasted a lot of our time! The tickets (which we validated when we arrived in Singapore) wouldn’t work! So we had the staff to contact SIA for us as to explain why the pass isn’t allowing the machine to give us tickets. First they told us that they will reissue a new code for us as we are entitled to gain entry to the theme park and will call us in 5mins with the new code. 10mins later, they called to say that they still haven’t got the new code and told us to wait an extra 10-15mins. By this time, we were quite frustrated as its hot, our time is wasting away and we have other places to go! They didn’t even call in 15mins but 25mins later! You would think that it’s good news but no…they called to tell us that our pass was not entitled for Universal Studios after all! Imagine waiting for a long time, past the designated time, outside in the humidity with the sun glaring through our shades..we were so annoyed! We could have used that time to see other things that we were entitled to in our pass! They couldn’t do anything right! Luckily, Universal Studios gave us complimentary one day passes after that whole debacle! By this time, it was already past 1pm. I’m appreciative for Universal Studios in allowing us to enter the park. Thank you! Singapore Airlines..you disappoint me and you need to step up ur game. There will definitely be a complaint! – complained to them and they actually tried to sweep it under the rug by talking about another incident which was irrelevant. Not cool guys. Anyways, we only had time to go on 2 rides since we had a dinner appointment all the way back at Dhoby Ghout with close friends. after going on a few rides, we left to Dhoby Ghout to meet with close friends for dinner. 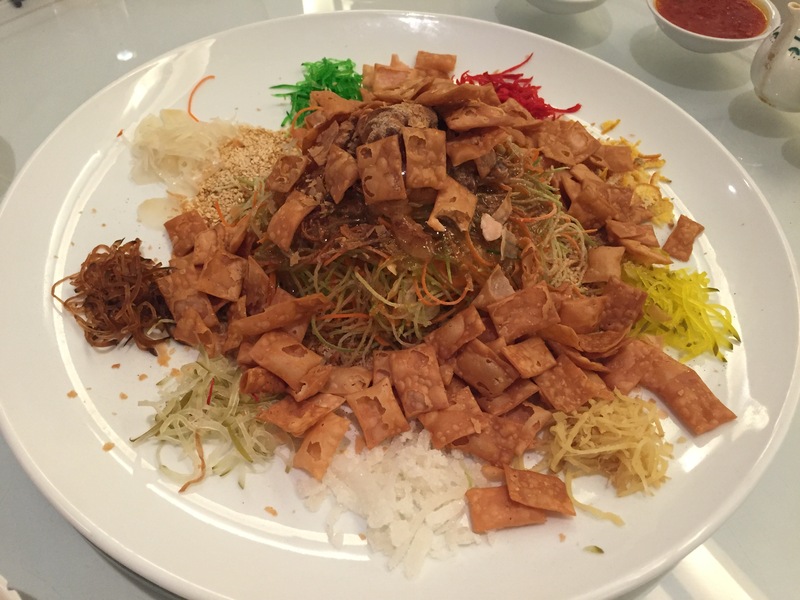 We had another Loh Hei and had a huge catch up! 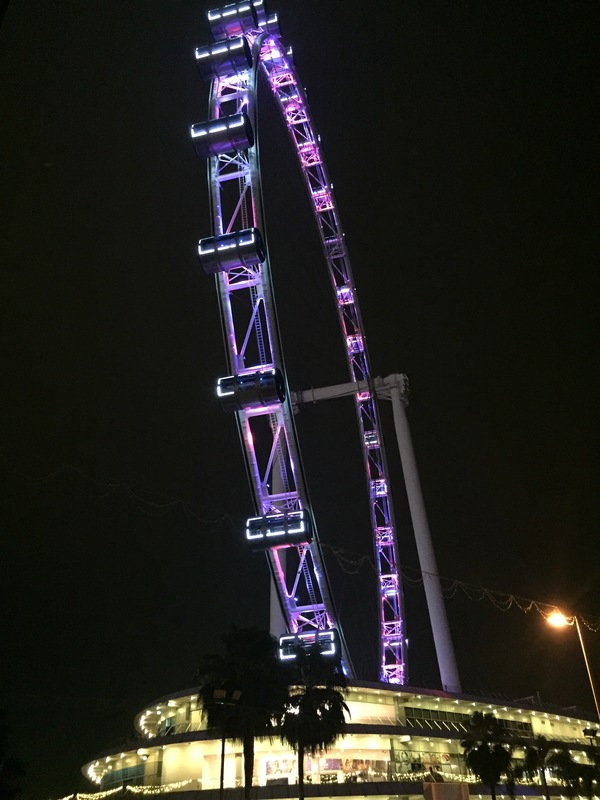 After that, we went straight to Marina Bay to go on the Singapore Flyer where we were taken off to see the amazing view of the city. Today we travelled all the way to Chinatown to eat EAT EAT! We went to Maxwell Road Hawker Centre where there are many known stalls. Being peak hour, it was hard to find seats so we had to share a table with some people, which didn’t matter much to me as long as I get to eat! We wanted to order chicken at Tian Tian but there was such a long queue! Luckily we didn’t as the person who sat next to us told us he waited 30mins for it and it wasn’t worth the wait. Phew! Anyways, we ordered porridge from this well known store and bee hoon. YUM YUM YUM! Then for dinner, we went to Causeway Point again hahas! This time, we went to this Thai restuarant for food with our dearest grandpa! It was YUM! I swear, their dishes are spicy but so flavoursome! Love it! And amazing! Happy Galentines Day! Spent this day with my gals then guys as I hung out with people I haven’t seen in years! 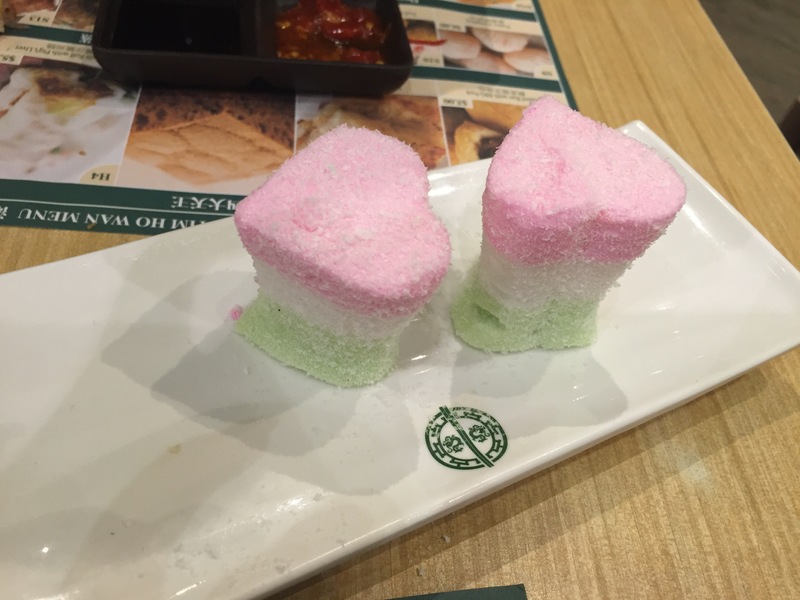 We went to Tim Ho Wan for brunch which was quite nice and they gave us a complimentary dessert for Valentine’s Day (tasted awful btw). Then we went shopping ~ I bought some face masks since Singapore is ruining my skin with pimples 😿😿 and also went shopping for SHOES! However, the shoes I wanted was the last one left at this store and it had a mark! Of course I’m not going to spend $250+ on a defected shoe! 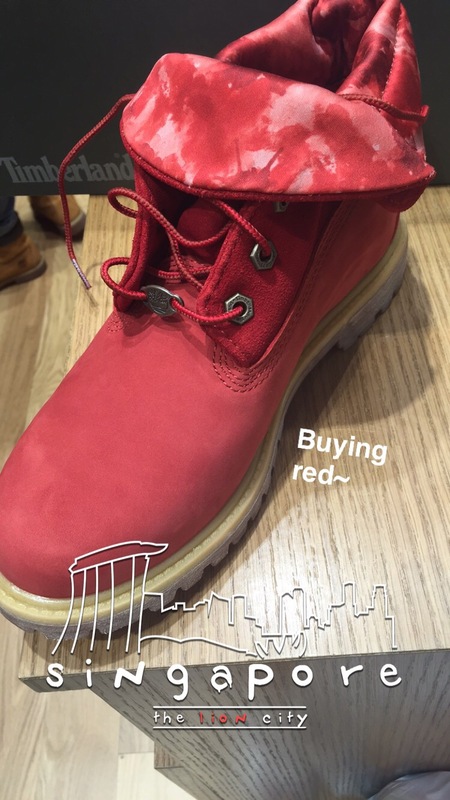 So I went to Vivo to check this same pair out, and luckily it had no marks nor scratches! So I bought it! We also went to Gardens by the Bay to take in some sights but we didn’t sight-see for too long since it was terribly hot and sticky! So we travelled to this Hawker Centre near Red Hill MRT station where I had a wonderful chicken rice as well as the best sour sop dessert!!! Flavoursome and utterly delicious!